I love being part of a bookclub. I love connecting with my peers and talking about subjects that would not come up in ordinary everyday conversation. And I particularly love that I have been exposed to literature I would never have found on my own. Some of the books we have read are from the fiction section, and some are from the non-fiction section of the library. I think that the ones I have loved the most were the beautifully written books from the non-fiction section of the library, because they are gorgeous to read and they move me the most toward action. Welcome to "Acts of Faith", by Eboo Patel. This one is a total winner (nice pick, Kristine! ), and since I've been racing to finish it this past week and it has been consuming my thoughts and my spare time, I thought I would tell you a little about it. In a very small nutshell, Acts of Faith is the story of an American Muslim who tells the story of his life and search for religious identity, a movement for interfaith service amongst youth and young adults, and his founding of a worldwide grassroots organization dedicated to the cause of interfaith youth service. His basic thesis, which weaves throughout his biographical story in sketches, is that our faith communities are failing our young people. We need to pay attention to the search for religious and spiritual identity that young people often experience as they step into the wider world, and help them to place their faith in the context of cooperation with other religions towards common positive ends, so that spiritually seeking young people are not attracted instead to the well-funded extremest religious circles that turn young people into suicide bombers, and shooters, and people who commit acts of hatred while claiming to work in the name of God. 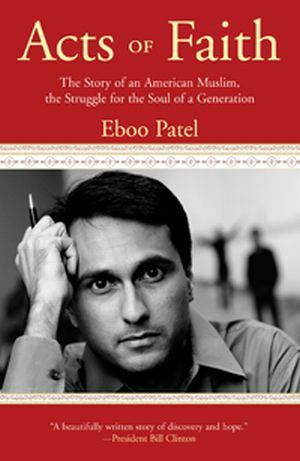 Eboo Patel provides sketches of young men from Muslim, Christian, Jewish and Hindu communities who led relatively normal lives until at peak times in their search for religious identity, were brought under the tutelage and care of the wrong people. These wrong people taught these young men to feel humiliated and unjustly dealt with by those from another faith, and they elevated the work of killing and made it holy. Eboo's work is to bring young people together, find common values, such as hospitality, or compassion, and put the youth to work side by side on projects that complement their shared values. His organization helps the youth to identify with their prospective religions by asking them to share examples from their holy texts or scriptures that illustrate their common values. The final chapter of the book is my favorite. I've written out a few of my favorite paragraphs just because I loved them. This next bit is about the logistics of starting the Interfaith Youth Core and the challenge of sharing his vision with religious leaders from the Chicago area, from whom Eboo would need support if he wanted his organization to become a reality. 'I totally understand your position,' I told him. 'The truth is, most religious people feel that way. I certainly believe that Islam has something unique and powerful that holds my allegiance, and I believe one of my most important responsibilities as a Muslim is passing down my tradition to the next generation.' I saw him easing a little bit in his chair. By proclaiming our strong commitment to our respective faiths, even intimating that we believed what we each had was superior, we had cleared the way for an honest conversation. Neither of us was offended by the other's faith commitment. To the contrary, it had created a common bond - two men of deep but different faiths talking about religious cooperation." So, after you have burned through the romance novels at the beach this summer and are looking for something with a bit of meat, find Acts of Faith! Even if you are not part of a religious community, it is an inspiring and worthy read.